Home Wi-Fi performance is still a let-down for many, but Cisco Linksys is hoping that a quartet of new additions to its Smart Wi-Fi range will ease our pain. 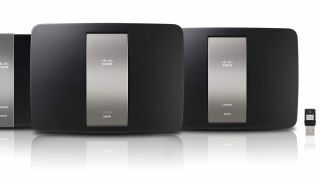 Linksys is using the traditional stage of CES 2013 to show off its expanded range, and believes that consumers deserve better than the current generation of bland and inefficient networking kit. The three new routers and one compact USB adapter, all rocking 802.11ac of course, are called Smart because they allow greater control over who is using what bandwidth and for what, as well as greater speed. Linksys is aiming to provide for our increasing desire to have multiple devices linked up simultaneously with the range-topping AC1750 allowing for 10 gadgets all connected and, potentially, streaming HD (dependent on your broadband of course) with speeds of up to 1300 Mbps on the 5GHz band. The AC1200 and AC1600 can handle 3 to 5 or 5 to 7 devices respectively and, along with the adapter, will all be taking a public bow in spring. As you may expect, the new Linksys routers are also equipped with Gigabit Ethernet and USB 3.0 ports that will allow for storage devices such as USB flash drives or hard drives, to be connected to the router.